The next deadline is March 24, 2019. Shipping starts on April 7, 2019. Please give us a few days to update the page. We present a Good Luck Charm of 5 Japanese Yen Coin! We deliver the package anywhere if SAL(Japan Post Economy Air) service is available. Average delivery time is 2 to 3 weeks. 2. Deadline is the end of the month. For example, if it's April the deadline is April 30th and the shipping out is May 7th. We ship your package out from Osaka, Japan. Osaka is the centre of the Japanese food culture. This is an assortment of snacks, candies, chocolate etc which includes 15-20 items. The weigh of the contents is about 1.5lbs (700g). The price is flat all over the world. You can get a fun time in $39 every month. Shipment is free of charge. You can check the delivery status by the tracking number. If the package doesn't arrive, we refund you the expense. You can cancel this subscription service at anytime. We accept your payment by credit card or PayPal. Some in the assortment are chosen by your vote. Let's vote on the following. Please fill out the form below and send it to us. Some snacks are decided by your vote. 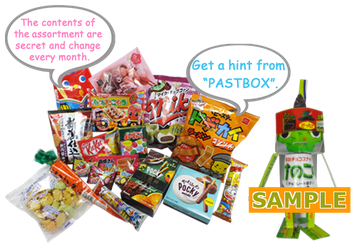 The snack which has got the most vote is included in the next package.